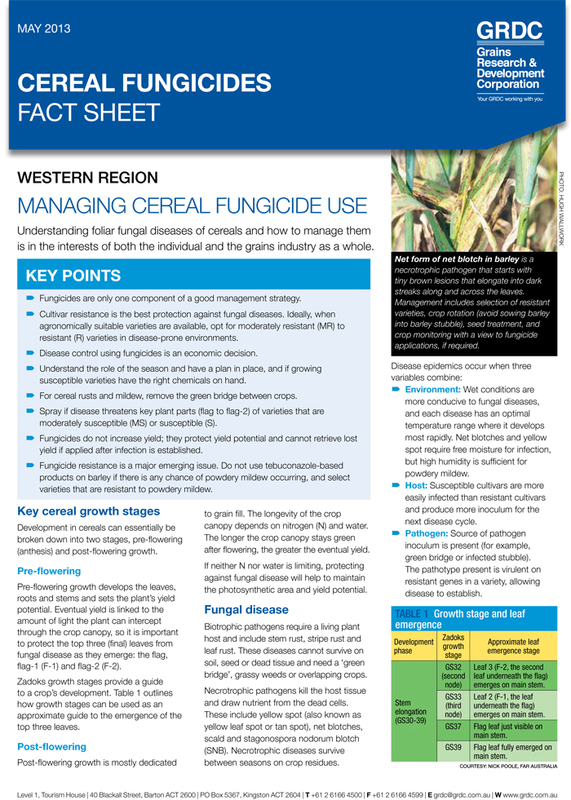 Understanding foliar fungal diseases of cereals and how to manage them is in the interests of both the individual and the grains industry as a whole. Most diseases that affect cereals are caused by fungi. A fungal species that causes disease is called a pathogen. Fungicides are only one component of a good management strategy. Correct identification of the cause of plant symptoms is essential, and an understanding of the growth and spread of any pathogen will assist in any decision making. Cultivar resistance is the best protection against fungal diseases. Ideally, when agronomically suitable varieties are available, opt for moderately resistant (MR) to resistant (R) varieties in disease-prone environments. Disease control using fungicides is an economic decision. Understand the role of the season and have a plan in place, and if growing susceptible varieties have the right chemicals on hand. For cereal rusts and mildew, remove the green bridge between crops to prevent rusts from over-seasoning. Monitor crops throughout the season. Spray if disease threatens key plant parts (flag to flag-2) of varieties that are moderately susceptible (MS) or susceptible (S). Fungicides do not increase yield; they protect yield potential and cannot retrieve lost yield if applied after infection is established. Fungicide resistance is a major emerging issue. Do not use tebuconazole-based products on barley if there is any chance of powdery mildew occurring, and select varieties that are resistant to powdery mildew.